Andrea and Alvin are two of Canada's top dance choreographers. I have reviewed some of their past performances. This entry was posted in Cultural Fusion, Main Page, Multicultural events, Upcoming Events, Visual Art and related events on October 30, 2008 by Todd. WHERE: Scottish Cultural Centre, 8886 Hudson (at 73rd Ave), Vancouver, B.C. This entry was posted in Main Page on October 30, 2008 by Todd. Important WW2 Canadian history is celebrated by the Chinese Canadian Military Museum, celebrating 10th Anniversary. My grand-uncle Daniel Lee and his friend Ed Lee carry the flags for the colour party to help lead the procession of Chinese Canadian veterans to help begin the ceremonies for the 10th anniversary dinner for the Chinese Canadian Military Museum – photo Patrick Tam/Flunging Pictures. When Canada was fighting WW2, the Canadian government initially didn't want any soldiers of Chinese ethnicity – even if they had been born in Canada. Several Chinese Canadians argued that they should fight for Canada and volunteered for service. This action later helped them lobby to give Chinese-Canadians the franchise to vote in 1947. It was a wonderful evening at the 10th Anniversary celebration dinner for the Chinese Canadian Military Museum. I attended the dinner with my friends Stuart Mackinnon and George Jung. We sat with Chinese American WW2 veterans from Seattle. 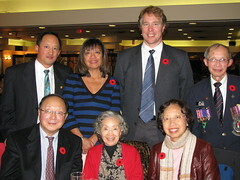 Peggy Lee-Wong, one of the first Chinese-Canadian women to serve in WW2, also sat with us. 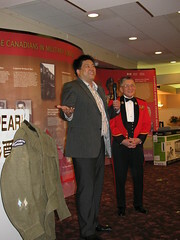 Col. Howe Lee is the founder of the Chinese Canadian Military Museum. Congratulating him is Ellen Woodsworth, former Vancouver city counilor seeking re-election this fall. Both of these people are wonderful community builders, and I admire them greatly. – photo Patrick Tam / Flunging Pictures. My friend Judy Maxwell gave a short talk about the history of the Chinese Canadian Military Museum. She has done a lot of research for CCMM. – photo Todd Wong. Last year, John Yap MLA for Richmond Steveston invited the veterans to the BC Legislature and highlighted the 60th anniversary of Chinese Canadian citizenship. The following is from his press release re-printed on the CCMM website. 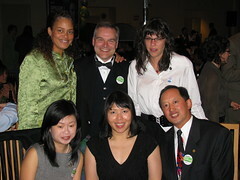 This entry was posted in Chinese Canadian History, Food & Restaurants, Main Page, politics and politicians, Vancouver Heritage and History on October 28, 2008 by Todd. How come it dook so long for Asians and First Nations to get the vote in BC? It's the 150th Anniversary of the founding of the colony of British Columbia. But First Nations people have only been voting for 48 years since 1960, Canadians of Japanese ancestry for 59 yeras since 1949, and Canadians of Chinese ancestry for 61 years since 1947. What took so long? Come check out the following event and find out why. Okay… I will try NOT to use the “R” word. was a BC Book Prize non-ficition nominee for 2008. Larry Grant can be quite funny – he has a very witty sense of humour. He just did the First Nations greeting for the Chinese Canadian Military Museum 10th Anniversary Dinner on Friday Night – I would love to have him as a guest for the the Gung Haggis Fat Choy dinner in 2009.
this exclusion of rights has affected British Columbia. 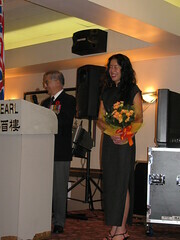 This entry was posted in Asian Canadian Cultural Events, Canadian Identity & Heritage, Chinese Canadian History, Main Page, Multicultural events, Upcoming Events, Vancouver Heritage and History on October 27, 2008 by Todd. 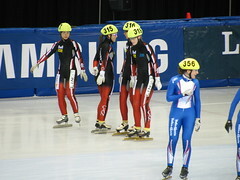 It's the second World Cup short track speed skating event, and it is in Vancouver BC, the site of the 2010 Winter Olympics. One of the premier short track speed skaters is American Apolo Ohno who was born and raised in Seattle Wa. Ohno is Hapa. His father Japanese-born father raised him as a single dad. But the Canadians are tough too! it was developed,” says Michael Gilday. 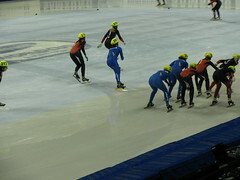 On Friday we saw top Canadian Michael Gilday and the Women's Relay team race in qualifying rounds. They both held the lead in their respective races until the final laps. But that was okay, top two finishers moved on. Hope they perform well for the rest of the weekend into the finals. It's kind of a strange relay race. They don't pass a baton. They tag each other up, and in between they take turns giving each other a push to initiate the relay and keep their momentuum going. This entry was posted in Main Page on October 25, 2008 by Todd. mid-1980's, and reading about Chinese ghosts in Paul Yee's books, such Ghost Train or Dead Man's Gold & Other Stories. To compare ghosts stories and after-life stories from around the world sounds like something out of Joseph Campbell's mythology work. Cool…. Composers –Sutrisno Hartana, Kenneth Newby, Farshid Samandari, Barry Truax, Lan Tung, Jin Zhang, Ya-wen V. Wang. This entry was posted in Asian Canadian Cultural Events, Cultural Fusion, Main Page, Multicultural events, Music, Theatre, Upcoming Events, Visual Art and related events on October 25, 2008 by Todd. Vancouver Parks Board candidate Stuart Mackinnon blends multiculturalism with Green Party environmental issues. 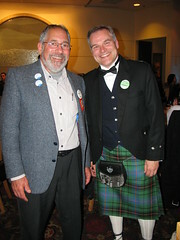 This week I have had the pleasure to attend dinner events with Stuart Mackinnon, Vancouver parks board candidate for the Green Party. On Thursday, we attended the Oct 23rd Vision Vancouver dinner at Floata Restaurant. On Friday, we attended the Oct 24th Chinese Canadian Military Museum 10th Anniversary dinner, where we also volunteered to help sell raffle tickets. On Tuesday, I spoke on Stuart's behalf at the Vancouver & District Labour Council. The following is an amendment to what I said about why I believe Stuart will be a great Vancouver Parks Board Commissioner, with pictures from the Vision Vancouver Floata dinner. Stuart Mackinnon is active. He speaks out on issues. He attends Parks board meetings. He has been a thorn in the NPA side, to make sure they follow proper democratic process. The first time I met Stuart, it was through his blog Better Parks. He was writing about naming the proposed “Selkirk Park” at 72nd St.
helped to make it more of a democratic process. Stuart has fought against the privatizing of parks, such as against the imposition of high priced restaurants at Kitsilano Beach and English Bay. then guided them to a silver medal in their first year of competition. builder, and ensure that every person is included and feels empowered. is Scottish – of Scottish descent. I am of Chinese descent. Mackinnon will be honorable in supporting these values. Stuart genuinely cares about our environment and is a past president of SPEC (the Society Promoting Environmental Conservation) and past chair for Vancouver Green Party. city workers, but more important, he will be empowering. I believe in Stuart. He will be honourable. This entry was posted in Main Page, politics and politicians on October 25, 2008 by Todd. Vision Vancouver shows off it's connections with Vancouver's cultural diversity: Sikh, Taiwanese, First Nations, Chinese pioneers, and even Scottish! As a Vancouver city library worker, I see so much of Vancouver's multicultural population. We have books in many different languages, and many patrons who borrow books in Chinese, French, Italian, Vietnamese, Spanish and Russian. We have many different ethnicities in our work force. It is important for Vancouver's City Council, Parks Board and School Board to reflect and understand the cultural and ethnic diversity that it represents. It was an incredibly diverse display of Vancouver's cultural diversity attending Vision Vancouver's fundraising dinner at Floata Restaurant on Oct 23, Thursday. There were new immigrants. There were multi-generational Vancouverities. There were First Nations, Sikh, Taiwanese, and Chinese community tables. There were even COPE and Greens all attending. It was a wonderfully inclusive example of community. on Scotland’s west coast. Deal was born England and raised in Michigan, while Robertson was born in Vancouver. Add to the mix Alvin Singh and Allan Wong for School Board, and Raj Hundal for Parks Board, and the Vision / COPE / Green slate has 8 members of visible minority ethnicity. Okay, we can say that “race” shouldn't matter. But it does matter in many different ways. We are who we are because of our personal experiences. If we have experienced racism, or ethnic diversity – it can enhance our outlook in life. But we can't all be the same, or have the same experiences – this is why for any working group, it is important to have a range of skills, talents, and viewpoints. Ethnic or cultural experience can be one of these factors. And for a multi-cultural city like Vancouver which has multi-generations of intercultural activitiy, cultural diversity can be a very important factor. It was a great honour to meet Miles Richardson – former President of the Haida Nation who received the Order of Canada earlier this year. Pat Kelly was sitting with him, and I introduced my friend Constance Barnes to them. Constance's father is for BC MLA Emery Barnes, another one of BC's great figures as both politician and BC Lions football player. I had the pleasure of meeing Tanya Tagaq on Thursday night, after she performed at the Music on Main series. Tanya has been called the “Jimi Hendrix of Inuit throat singing” by David Harrington, Kronos Quartet. In August, I received her sophomore album titled “Tagaq.” It is a strange album. It is earthy. It is primordial. It is ethereal. It is unlike anything you have ever heard before. It is transformative. I found some other you tube videos of Tanya. Listen to them. Watch them. You will be amazed, by both her traditional performances and her contemporary performances. Tanya was in Vancouver in August, and she performed her contemporary work. This entry was posted in Cultural Fusion, Main Page, Multicultural events, Music on October 25, 2008 by Todd. Vancouver & District Labour Council endorses progressive candidates for Nov 15 civic elections in Vancouver, Richmond and North Vancouver. It was my first meeting as a delegate for CUPE 391, Vancouver Library Workers, who recently joined the Vancouver & District Labour Council. The meetings are held at the Vancouver Maritime Labour Centre, which I first visited as a guest speaker for a human rights themed meeting for the VDLC a few years ago, while I was active on the Save Kogawa House campaign. This time, I was sworn in as a delegate along with fellow CUPE 391 library worker Lily Gee. I am on the CUPE 391 executive as a member at large. It was an exciting evening as many of the local politicians came to be introduced, and to speak to the labour council which includes and affiliates with 106 unions and union locals including CUPE, CAW, Hospital Employees Union , BCGEU, BC Nurses, Public Service Alliance, Communications, Energy and Paperworkers' Union, Telecommunications Workers' Union, United Fishermen and Allied Workers' Union + many more. It is a union of unions. On my arrival I chatted with North Vancouver Mayor Darrell Mussatto, who I had recently seen only a week before at our 30 year Carson Graham High School Reunion. 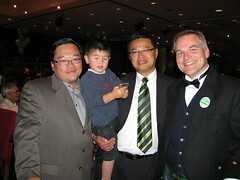 He introduced me to his fellow North Van City councilors Sam Schecter and Craig Keating as well as candidate Cheryl Leia. Darrell is running for re-election and will be acclaimed as he is unopposed, but still he was there to accept endorsement from the V&DLC. I checked in with V&DLC president Bill Saunders, whom I first met when he was an organizer of the “Anniversaries of Change” program which recognized the 1907 Chinatown Riot by Anti-Asian labourers. Bill was a big supporter of the CUPE 391 Vancouver Library Workers strike action, and when he visited our picket line at the Word on the Street Festival, he sang along to “O Solo Mio” as I played my accordion. Soon many of the Vancouver candidates for council, parks board and school board arrived. I have gotten to know many of them over the past years through my community work for Joy Kogawa House, Asian Canadian Writers's Workshop and Chinese Head Tax campaign. As well, many of them like to attend my Gung Haggis Fat Choy Robbie Burns Chinese New Year Dinner event. It is always good to see Ellen Woodsworth, Heather Deal, Raymond Louie and David Cadman who gave great assistance and support for the Save Kogawa House campaign. Andrea Reimer, Kerry Jang and Aaron Jasper are also wonderful people that I really enjoyed getting to know, and was pleased to give them endorsements for the nomination candidacy for the Vision Vancouver nomination elections. It was an exciting meeting because the Vision/COPE/Green slate for Vancouver civic election was to be introduced and endorsed. The meeting started and Vancouver candidates were introduced first. City council, school board and parks board candidates were introduced respectively by party. 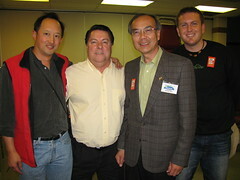 George Chow spoke for the Vision councilors and David Cadman spoke for the COPE councilors. Both emphasized how difficult negotiations for the three civic unions had been under the NPA dominated Vancouver city council. David Cadman spoke how the unions were not treated fairly when the GVRD Labour Relations Bureau walked away from negotiations. 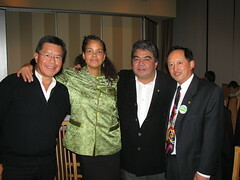 Both he and Chow promised that both Vision and COPE sought to build better relations with their civic employees. This was a theme that was also echoed later by North Vancouver City Mayor Darrell Mussatto and councilor Craig Keating, when they shared that North Vancouver City had avoided strikes by working with their unions in respect and fairness for bargaining. Sharon Gregson spoke for Vision School Board candidates and Bill Bargeman represented COPE candidates. For Parks Board, Aaron Jasper spoke for Vision and Loretta Woodcock spoke for COPE. Both Jasper and Woodcock gave very impassioned talks that emphasized the importance of the Vancouver civic workers, as well as paying attention to Vancouver's cultural diversity. Stuart Mackinnon, Parks Board candidate for the Green Party was unable to attend, and had asked me to represent him as we are friends. I spoke about Stuart's activism in attending Parks Board meetings and his citizen involvement in parks issues such as the democratic naming of future parks and his criticism of park privatization such as the concession stands and Watermark Restaurant. I shared that Stuart was a union brother, as a school teacher at Killarney Secondary School, and as a former vice-president of CUPE 392 of the BC Teachers Federation. Afterwards, I was complimented on giving Stuart such as strong introduction and endorsement. The Vision / COPE / Green Vancouver city council slate has an amazing amount of cultural diversity. 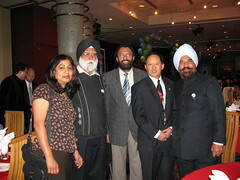 George Chow, Kerry Jang and Raymond Louie have Chinese ancestry and Kashmir Dhaliwal is South Asian. Tim Stevenson is gay, Ellen Woodsworth is lesbian and Raymond Louie's wife has Scottish ancestry… as does Heather Deal. I have also managed to get kilts on Deal, Louie, and Stevenson, but only tartan sashes so far on George Chow and Ellen Woodsworth. 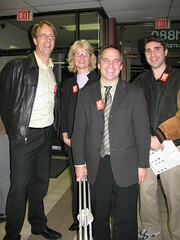 David Cadman has been involved nationally and internationlly with the United Nations Association. 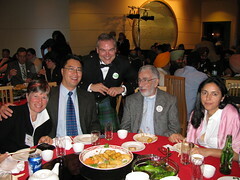 All the councilor candidates including Geoff Meggs and Andrea Reimer attended the 2008 Gung Haggis Fat Choy dinner with the exception of Kashmir Dhaliwal. The Vancouver School Board slate includes Ken Clement – of Ktunaxa First Nations, Alvin Singh – South Asian ancestry, and Allan Wong – Chinese ancestry. 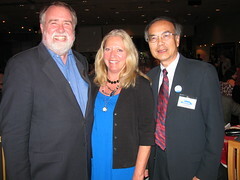 I first met Al Blakey, Jane Bouey and Allan Wong when I did a Vancouver Asian Heritage Month Society presentation for the Vancouver School Board back in 2002. I have also since met Sharon Gregson, Alvin Singh and Bill Bargeman. The Vancouver Parks Board slate is very ethnic-culture cool! Constance Barnes is Afro-Canadian, the daughter of Emery Barnes – former speaker of the BC Legislature, and she is operations manager for the Dr. Sun Yat Sen Classical Chinese Gardens. Raj Hundal is Sikh, and last night explained to me some of the traditions that I didn't know. 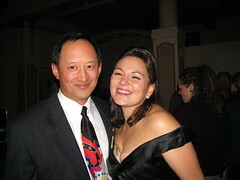 Aaron Jasper's wife is South Asian, and they both were volunteers at the 2008 Gung Haggis Fat Choy dinner. Stuart Mackinnon has spent more time in China than I have, but he didn't own a kilt until after he joined the Gung Haggis Fat Choy dragon boat team. 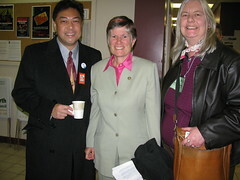 I've also met Loretta Woodcock and Anita Romaniuk over the years. Sarah Blyth tracked me down for our introductions at this year's Taiwanese Cultural Festival and I hope to get this skateboarder onto a dragon boat sometime soon. This entry was posted in Main Page, politics and politicians on October 22, 2008 by Todd.